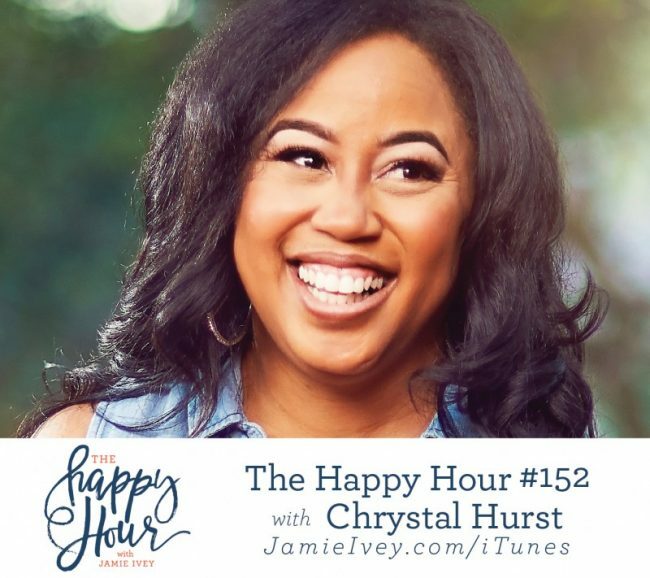 My friend Chrystal Hurst joins me today for episode #152 of The Happy Hour. Chrystal is a writer, speaker, and worship leader in addition to serving as the chief executive operating officer in her home as a wife, mother of five and grandmother to one. Chrystal is co-author of, Kingdom Woman and her second book, She’s Still There coming out next week. She also blogs and podcasts regularly at Chrystal’s Chronicles where she poignantly reflects her thoughts about her faith and day-to- day experiences. In our conversation today, Chrystal and I talk about her new role as a grandmother and how she still doesn't have a grandmother name (!!!). We chat about the sacrifices she has made to pursue her calling and gifts. She shares such valuable nuggets of wisdom about being present in the season you are in and not chasing after someone else's story. We talk about her new book, She's Still There - a book about rescuing the girl that is still inside of you. I have read every page and I can't wait for you to get a hold of it. And Chrystal does a fabulous job explaining why pre-ordering a book is important. This conversation was so good for my soul, and I hope it is for you too.